This is a 16" 9MM contour profile parkerized 1:10 twist AR15 barrel. The process of making this barrel is very thorough it involves the barrel to be cut, rifled, and assembled entirely in the USA by one of the biggest barrel manufacturers in America. Each barrel is individually inspected 100% and air gauged to ensure it meets their stringent specifications.These Barrels are manufactured under the ISO-9002 Quality Systems and are manufactured from two types of steel: 4150 Gun Quality Steel, Heat Treated to RC 28-32 Hardness, and Stress Relieved. 416 Stainless Steel, Heat Treated to RC 28-32 Hardness, and Stress Relieved. 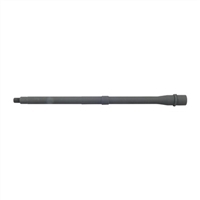 This barrel is threaded 1/2x36 using a Blow Back System that needs no Gas Block or Gas Tube.Make sure not to miss out on this quality barrel at a great price today!! This 9mm chambered 5.5 inch Modern Series Barrel is machined from 4150 Chrome Moly Vanadium steel with a QPQ Corrosion Resistant Finish and 1/2-36 x threads. This 9mm chambered 8.3 inch Modern Series Barrel is machined from 4150 Chrome Moly Vanadium steel with a QPQ Corrosion Resistant Finish and 1/2-28 x .400 full profile threads. New Frontier Armory 16" 9mm Premium AR15 Barrel. Made in the USA. Make sure not to miss out on this quality barrel at a great price today! !